The Congress Centre project for the city of Mons in Belgium is a “design & build” contract won through an international competition. The building will be operational in 2015, when Mons will be the European Capital of Culture. Situated between the historic centre and the new suburban zone - which will include a train station designed by Santiago Calatrava - the Congress Centre constitutes a focal point for the economic and social development of Mons. By creating a visual link with the Beffroi tower, the intention of Studio Daniel Libeskind architects was for the building to be fully integrated into the public and cultural urban tissue. 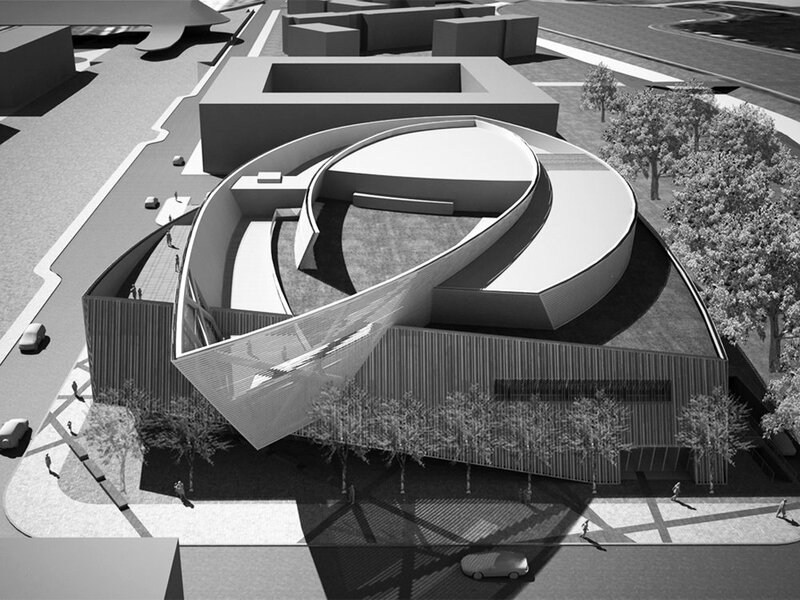 This concept, seen as “urban blossoming”, is reflected in the open spiral form of the building. The programme comprises three auditoria seating up to 800 people, multi-purpose halls of up to 1,640 m2, offices, a restaurant, a 158-space underground parking facility and a viewing platform accessible to the public via a roof promenade. The project is currently under construction with a planned completion date in mid-2014. The main load bearing structure is formed by curved and inclined reinforced concrete walls termed “ribbons”, with their complex geometry following an ascending spiral. As well as creating a dynamic form, the ribbons are integral parts of the structure that allow the ground floor volumes to be uninterrupted by internal columns. They act as deep beams spanning as much as 28 m between supports and 15 m in cantilever. These ribbons are constructed using a novel technique of flexible prefabricated formwork panels. This structural formwork uses expanded metal sheets to contain the concrete, placed around a double layer of reinforcement mesh that provides the stiffness to the panel. All structural elements are prefabricated to the maximum extent: whenever possible precast planks or hollow-core slabs and prefabricated walls are used. For the heavily loaded roof beams spanning over 25 m, prestressed beams are used. 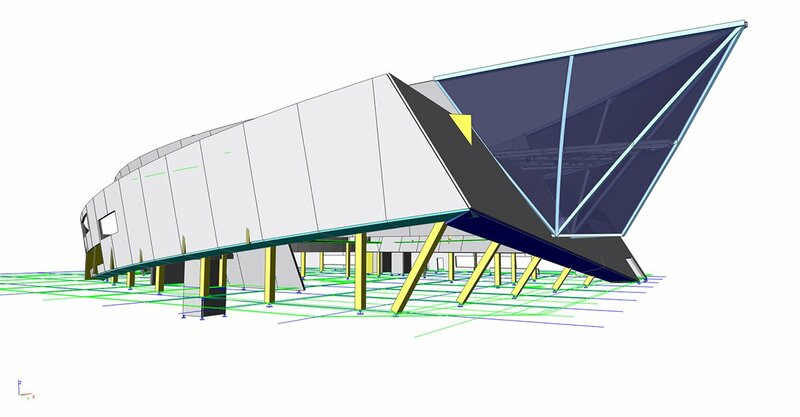 In order to avoid columns on the ground floor, the meeting rooms are located on a light composite slab which is suspended from the curved ribbon walls. At the tip of the building, the ribbons form a cantilevering wedge used as a viewing platform. In this specific location, the ribbons are made of a steel frame. The building is founded on a series of prefabricated piles driven into the ground. 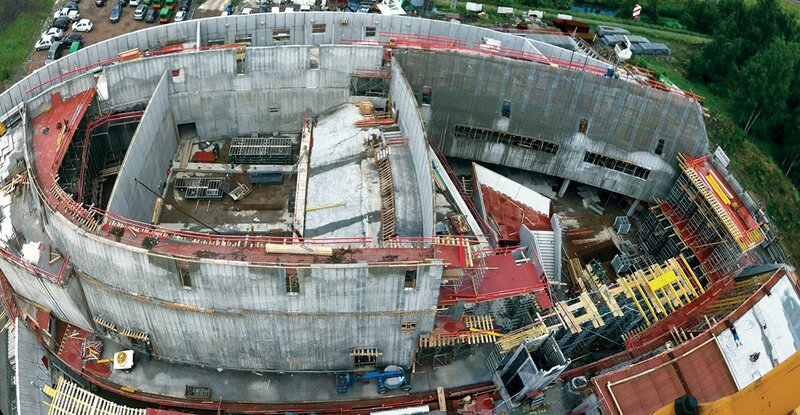 In order to gain construction time, pile caps were avoided by using a 40 cm basement slab. Due to the inclinations and curvatures of the ribbon walls, and the fact that the slabs are on different levels in each zone, overall stability was an important issue. The structural equilibrium had to be checked both for the complete structure and the intermediate construction stages. The complex geometry of the building was a challenge for the development of both the calculation models and the execution drawings. Using 3D drafting software, the curved and inclined surfaces of the ribbon walls were first modeled as a series of planar panels, reflecting the way they are constructed. These surfaces could then be imported into Scia Engineer as planar 2D members and connected to the slabs, beams and columns of the project. One important advantage of using 2D members rather than shells was that all 2D components such as openings and subregions were available in the Scia software. 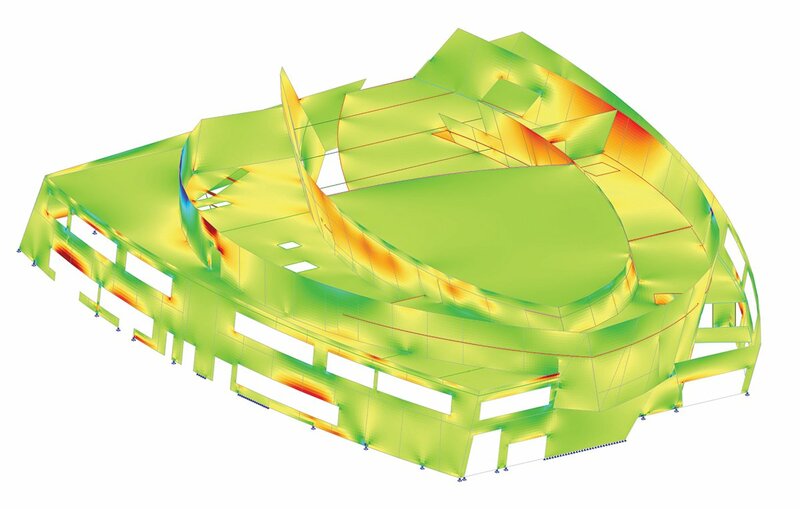 Different FEM calculation models were created in Scia Engineer that allowed for the testing of the structure at different scales, from the global complete building to local nodes connecting multiple elements. Using different settings for the mesh calculation times were optimised. The ribbon walls were tested both in individual models with lateral supports at slab locations and in a global model that takes into account the complex interaction between the structural elements. Several features of Scia Engineer were used according to requirements: the deformations in the concrete were calculated for the long term according to Eurocode 2, non-linear calculations were carried out for the steel structure of the viewing platform and automatic combinations in accordance with the Eurocodes were used to verify the concrete and steel elements. Specific models were also built to test the stability of elements at different construction stages using props at precise locations.